It’s that time of year again when my blog bursts back into life after months of neglect. 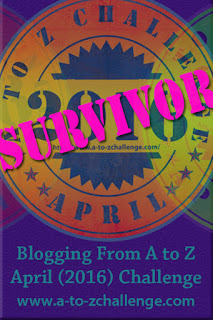 It’s the annual A to Z Blogging Challenge, a worldwide event that encourages bloggers to post daily using a letter of the alphabet as their prompt. Themes are optional, but as in previous years, I like to keep my posts focused. This year I’ve chosen the history of gardens, but not gardening, so don’t come looking for tips. This is about the people and places that have influenced gardeners and changed the way we look at horticulture, botany and natural landscapes. Britain is an ideal country for trees: temperate climate, plenty of rain, good soil and mild winters. Without people getting in the way, Britain would be covered in oak trees. This natural coverage of woodland declined due to the arrival of farming practices and urban development, and was further heavily depleted during the two world wars when timber was needed and there were no imports available. Now only 12% of Britain is wooded compared to other European countries, which can be as high as 37%. When woods are recreated these days, they are often done so in big managed plantations, but there are also the garden woods, the arboretums, a botanical collection exclusively made up of trees. If they’re conifers, they’re known as Pinetum; willows are Saliceta, and oaks are Querceta. The term arboretum was first used in a publication in 1833 by John Claudius Loudon. However, he wasn’t the first to think of planting exotic trees. In the times of the pharaohs, Hatshepsut (a female pharaoh) returned from an expedition to Punt with thirty-one frankincense trees, the roots were carried in baskets to protect them. The trees were planted in the mortuary temple at Deir el Bahri. This is supposedly the first recorded attempt to transplant foreign trees. The creation of arboretums was popular with property owners with big gardens. At Plas Newydd Gardens on the shores of the Menai Straits of North Wales, there are rhododendrons, azaleas and magnolias, and also an Australasian arboretum containing eucalyptus trees and a rare Chilean shrubs. Plants that have no natural heritage on these isles but have now become familiar, and sometimes invasive. Arboretums also make great public parks. Loudon designed the Derby Arboretum in Derby City. Commissioned by a private landowner, who donated land. It is the first publicly planned, landscaped urban garden in England and opened in 1840. It included ornate statues and fountains, including a Florentine Boar made from earthenware. The boar was decaptitated during an air raid in 1941, or was it? A more recent theory is that a child accidently destroyed it when climbing on it. The statue was replaced in 2005 with a bronze version. Loudon (1783-1843) was a horticulturist, landscape designer and prolific writer. His most significant work was Arboretum et Fruticetum Britannicum, which was issued in 63 monthly parts, including coloured hand drawn plates. He was also a city planner who supported the established of Green Belts. Crippled by arthiritis, he lost his arm during a botched operation in 1826 and learnt to write and draw with his left hand. Penniless he died of cancer in his wife’s arms. The best way to remember somebody is a memorial, and it seems fitting that the National Memorial Arboretum is a living memorial to fallen heroes: the armed forces, civil services including the police and fire services. With 300 dedicated memorials set amongst 150 acres of woodland, the arboretum was begun in 1997 and now has 30,000 trees planted in his grounds. I’d like to think that Loudon would have enjoyed wandering amongst the trees and perhaps, unfettered by pain, his spirit does live on there. Having done the research for this challenge, I agree, gardeners are visionaries. Great start to the challenge. It is alwasy good to remember that we can indeed to somethign for our woods, by planiting new plants. It often looks like we don’t think anything in taking them down, but we need a lot of convinsing to plant new ones. We need more trees in this country. More housing going up and trees coming down. I live close to the National Pinetum near Tunbridge Wells, a wonderful place I love to stroll around. A delightful start to the Challenge. I’m surprised that there’s a pinetum in the south east, would have though Scotland. Currently holidaying in centerparcs, which is full of Pines and woodpeckers. I had no idea there were so many different terms for arboretums, depending on if they had different types of trees! I’ve never heard of them either. Writing these posts has been very educational. Nothing like lush greenery and a canopy of trees. That bit about successful transplanting of foreign trees sounded quite interesting! The love of trees goes back a long way. I live adjacent to Arnold Arboretum in Boston, MA, which was opened in 1872. It’s very much in the British landscaping style but has trees from all over the world (sometimes called a “tree museum”). It’s a great place for a walk or a bike ride, and my kids’ school has regular field trips there. Must be beautiful in the fall. The whole of New England is one big amazing arboretum. I’d love to go back to Boston. What a fascinating theme for your A-to-Z! I live outside of Philadelphia, and the Morris Arboretum is a place I love to spend time in. It is really glorious. Um, I also totally relate to the “after months of neglect” thing. I barely ever post on my blog except during the fevered month of April. Probably not the best way to blog, but it appears to by my way. Are you going to talk about Batty Langley? He’s my favorite landscape gardening guy, partially because of his name, and partially because I find his books really interesting. I especially like the fold-out garden plans. It is fun to imagine what they were like. I’ve not heard of Batty Langley, but I shall look him up. He’ll fit in with my L post! Hey i loved ur post ….nature defines us …..I blogged on something nature based …. ← Drum roll… get your pitchforks and hoes ready!